Next-generation firewall Industry's first threat-focused NGFW provides ASA firewall functionality, advanced threat protection, and advanced breach detection and remediation combined in a single device. 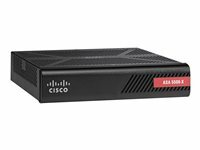 Proven ASA firewall It has a rich routing, stateful firewall, Network Address Translation, and dynamic clustering for high-performance, highly secure and reliable access with Cisco AnyConnect VPN. Market-leading NGIPS It has a superior threat prevention and mitigation for both known and unknown threats. Advanced malware protection Detection, blocking, tracking, analysis, and remediation protect the enterprise against targeted and persistent malware attacks. Full contextual awareness Policy enforcement is based on complete visibility of users, mobile devices, client-side applications, communication between virtual machines, vulnerabilities, threats, and URLs. Application control and URL filtering Application-layer control (over applications, geolocations, users, websites) and ability to enforce usage and tailor detection policies is based on custom applications and URLs. Enterprise-class management It has dashboards and drill-down reports of discovered hosts, applications, threats, and indications of compromise for comprehensive visibility. Streamlined operations automation It provides lower operating cost and administrative complexity with threat correlation, impact assessment, automated security policy tuning, and user identification. Purpose-built, scalable This is a highly scalable security appliance architecture that performs at up to multigigabit speeds (consistent and robust security across small office, branch offices, Internet edge, and data centers in either physical and virtual environments). On-device management It simplifies advanced threat defense management for small and medium sized business with small scale deployments. Remote Access VPN It extends secure corporate network access beyond corporate laptops to personal mobile devices, regardless of physical location; support for Cisco AnyConnect Secure Mobility Solution, with granular, application-level VPN capability, as well as native Apple iOS and Android VPN clients. Site-to-site VPN Protect traffic, including VoIP and client-server application data, across the distributed enterprise and branch offices. 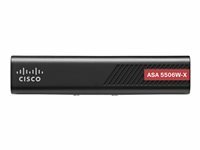 Integrated wireless access Integrated Wi-Fi is available in the desktop form factor (ASA 5506W-X) for compact and simplified small office deployments. Ruggedized form factor A ruggedized model (ASA 5506H-X), designed specifically for extreme environmental conditions, is available for critical infrastructure and control network applications. Third-party technology ecosystem Open API enables the third-party technology ecosystem to integrate with existing customer work streams. Integration with Snort and OpenAppID Open source security integration with Snort and OpenAppID gives access to community resources and ability to easily customize security to address new and specific threats and applications quickly. Collective Security intelligence (CSI) Unmatched security and web reputation intelligence provides real-time threat intelligence and security protection. Unprecedented network visibility Cisco ASA with FirePOWER Services is centrally managed by the Cisco FireSIGHT Management Center, which provides security teams with comprehensive visibility into and control over activity within the network. Such visibility includes users, devices, communication between virtual machines, vulnerabilities, threats, client-side applications, files, and web sites. Holistic, actionable indications of compromise (IoCs) correlate detailed network and endpoint event information and provide further visibility into malware infections. Cisco's enterprise-class management tools help administrators reduce complexity with unmatched visibility and control across NGFW deployments. Cisco FireSIGHT Management Center also provides content awareness with malware file trajectory that aids infection scoping and root cause determination to speed time to remediation. Reduced costs and complexity Cisco ASA with FirePOWER Services incorporates an integrated approach to threat defense, reducing capital and operating costs and administrative complexity. It smoothly integrates with the existing IT environment, work stream, and network fabric. The appliance family is highly scalable, performs at up to multigigabit speeds, and provides consistent and robust security across branch, Internet edge, and data centers in both physical and virtual environments. Superior multilayered protection Cisco ASA with FirePOWER Services brings distinctive threat-focused next-generation security services to the Cisco ASA 5500-X Series Next-Generation Firewalls and Cisco ASA 5585-X Adaptive Security Appliance firewall products. It provides comprehensive protection from known and advanced threats, including protection against targeted and persistent malware attacks. Cisco ASA is the world's most widely deployed, enterprise-class stateful firewall. Reduced costs and complexity Cisco ASA with FirePOWER Services incorporates an integrated approach to threat defense, reducing capital and operating costs and administrative complexity. It smoothly integrates with the existing IT environment, work stream, and network fabric. The appliance family is highly scalable, performs at up to multigigabit speeds, and provides consistent and robust security across branch, Internet edge, and data centers in both physical and virtual environments. With Cisco FireSIGHT Management Center, administrators can streamline operations to correlate threats, assess their impact, automatically tune security policy, and easily attribute user identities to security events. Cisco FireSIGHT Management Center continually monitors how the network is changing over time. New threats are automatically assessed to determine which ones can affect your business. Responses are then focused on remediation and network defenses are adapted to changing threat conditions. Critical security activities such as policy tuning are automated, saving time and effort, while protections and countermeasures are maintained in an optimal state.